One of the big issues with lupus is trying to keep track of everything: symptoms, medications, doctor's appointments, etc. It gets especially complicated when we're suffering the dreaded brain fog, and would be lucky to remember how to put our shoes on. You can find this on Android and iPhone. Main menu of the Lupus App. 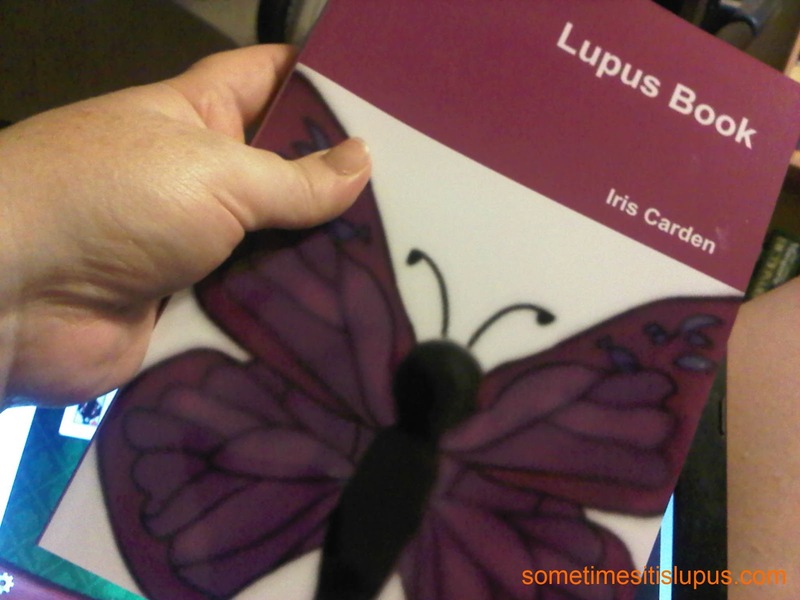 General information about managing lupus. A glossary of the terms your rheumatologist and other doctors are likely to use. A place to keep a summary of your medical history. A place to note symptoms and health concerns to discuss with your rheumatologist. Oh, did I mention you can get the app for free? That's another big plus. If you prefer to keep track of things on paper, the Lupus Book may be more your style. I wrote this to track things for myself. The disadvantage with the book, as opposed to the app, is that it's bigger and bulkier and you need to remember to carry it. The advantage is that you can tuck referral letters, prescription repeats, etc in between the pages, so everything stays together. Medication section of the book. There are pages for medical history, contact details of doctors, next of kin. 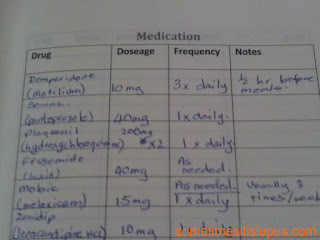 There is plenty of space for tracking medication, so that as it changes, one line can be crossed out and a new one written in at the end. It's not as neat as changing a line in an app, but you see what changes have happened over time. 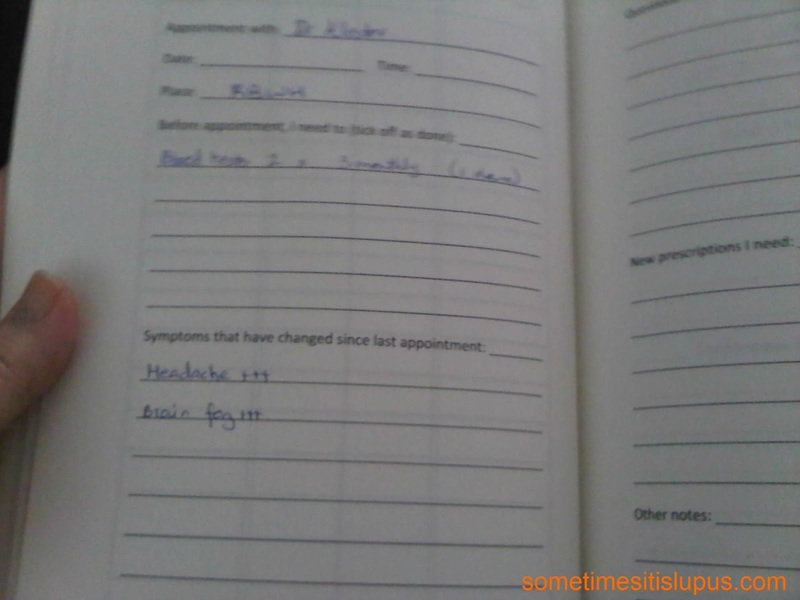 The largest section of the book is for appointments. appointment, questions you have and things that have changed since your last appointment. It also has the all-important section for prescriptions you need. The idea is to fill in things as the occur to you between appointments. 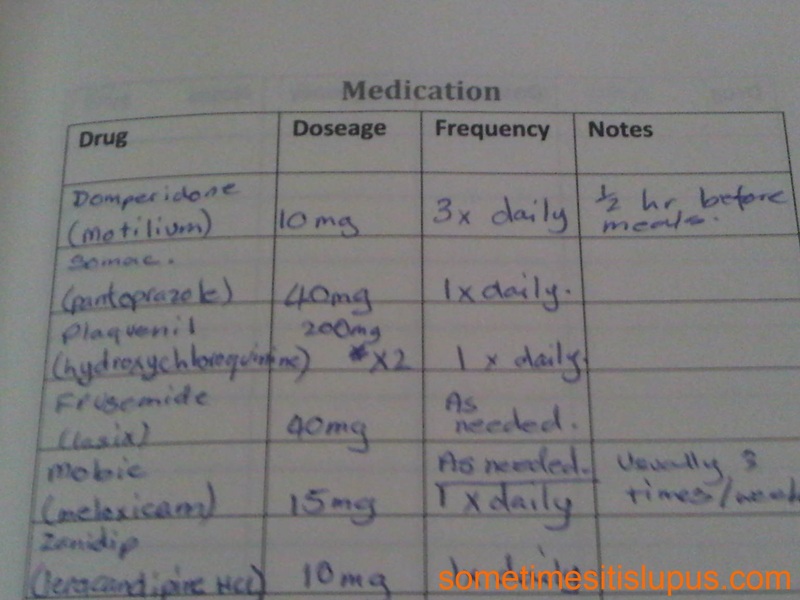 If you notice you're running low on repeats for a medication, write it in the book when you notice, so it's there when you go to your appointment. 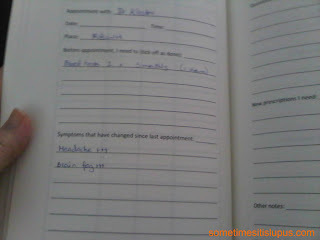 If you notice a new symptom, write it in the book when it happens, so you don't forget to mention it next visit. Because it's a book on paper, the publisher would have some problems with it being free, but I can tell you the cheapest place to get it. You can buy direct from the publisher here: http://www.lulu.com/spotlight/IrisCarden. It costs $12.60 (Australian) plus postage. Because Lulu is a print-on-demand publisher, they usually get the book printed for you in your own country to minimise postage costs and to save the environment the effort of shipping things huge distances.